Supervision system based on webserver that allow the control and the remote control solutions of installations in a simple way using the most common browser available on desktop, tablet and smartphone without install any additional software. Suitable for the supervision of technical installations and utilities such as refrigeration systems, supermarkets, hotels, shopping centers, hospital institute, service areas, professional kitchens and restaurants, allows to authorized personnel the management of installations and devices located throughout the territory. It provides real-time data acquisition, alarm management and multi-user interaction with remote equipment, offering tools for online technical support and for the analysis of HACCP data and energy monitoring. Modules for the acquisition of analogue inputs (temperatures, humidities, pressures, etc.) and digital inputs (states, alarms) which can be connected in an RS485 network. Temperature, humidity and light sensors, digital contacts, thermostats, energy meters, relay control, electrical supply socket, which can be connected via wireless network. Single phase and three phase electrical energy meters, TA, acquisition units for heat energy meters, gas, water. mobile ROUTER for the remote connection via web to the plantMANAGER system, making use of a mobile phone network or xADSL via OpenVPN; GSM modem for sending alarm notifications via SMS. 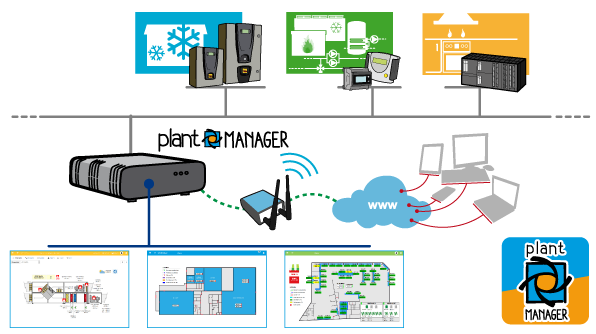 Gateway for the interfacing with the plantMANAGER system of third party devices such as those of Mitsubishi, Daikin, Samsung, Fujitsu, etc. and LON, KONNEX, BACNET, DALI, etc. protocols.